This is the real story of the tragic events that took place at the Fruivale BART Station in Oakland, CA on New Year’s 2009. After watching Fruitvale Station I instantly thought of the Stanford Prison Experiment in 1971, where several male volunteers got divided into two groups: Prisoners and wardens. The point of this case study was to show what effect authority can have on our psyche. At the end the experiment had to be discontinued since the sudden authority went to the wardens’ heads and they showed signs of mentally abusing the fake prisoners. What I am trying to say is people with a high authority can be a danger to everyone. In 22 year- old Oscar Grant III’ s case a bunch of police officers took advantage of their power and let their aggressions out on a group of people who might not have been innocent all their lives but in this very moment they were. And the result of it was the death of a man who tried to get his life back on track. But whether he was shot purposely or accidentally doesn’t really matter to me, fact is it shouldn’t have started that way in the first place. If you take a look at the real footage it is obvious that they were barely fighting the police, but verbally expressing their anger. And a cop should know how to handle verbal attacks, wouldn’t you agree? Incidents like the one at Fruitvale BART Station in Oakland, CA make me wonder in how far armed forces are trained and prepared for extreme situations. And of course: Do they ever check if people come from a racist background? I personally feel unsafe when I see too many police cars around, even though they should create a feeling of comfort, but all it does is make me want to leave immediately. Now Don’t get me wrong, I am not trying to say that every policeman is a bipolar racist; I have met many decent and hard-working men in my short life, but I have also seen many who’s actions were rather questionable than helpful, and in the end the negative always stays on someone’s mind. 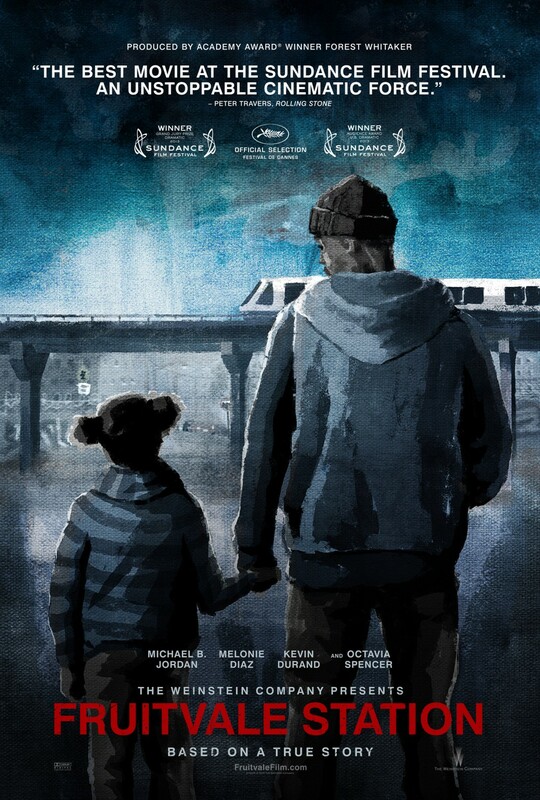 What I really liked about Fruitvale Station is that first-time director Ryan Coogler never tried to make Grant look like a saint or victim, nor did he give the impression that the policemen were complete monsters. He left room for interpretations. He also added some scenes that have never happened in reality, like a fun party on the train, or a scene where Oscar Grant III has an emotional moment with a straying pitbull, which have been criticized as “trying too hard to make events more dramatic”, but to me they just added some depth, and speak for his creativity. He added his own touch to it, and why not?! After all he is the director. What surprised me a little was the fact that he added a character that was completely fictional, yet seemed to be the reason for this tragic chain of reactions to happen the way they took place that night. The entire cast was terrific and convincing, and the relationship between Oscar and his mother, played by Octavia Spencer and Michael B Jordan was wonderfully played. The whole movie seemed more like a real life documentary, and a few intimate shots gave the impressions that we, the audience, were actually part of Oscar Grant’s life. No one really knows what his intentions or further plans were but Oscar himself, but judging by the statements of his family he wanted to change desperately, especially for his daughter. He was talking about moving and starting a new life. But all this was taken from him because of a lack of communication and professionalism from authorities who should have known better. A sad and moving story, put into an impressive and real movie. In my opinion it didn’t need an R- rating, it should have been PG-13, because those are the ones who need to see these movies. I’ve seen a couple of reviews of this and I really want to see it! I think it is worth it!